Quick Blast Offensive Zone Face Off | Ice Hockey Systems Inc. Here is an offensive zone face off play to use if you have a player that has an exceptional one-timer. 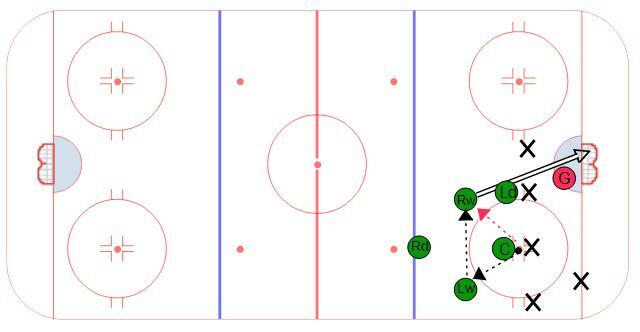 To set up, the shooter will be set off the hash marks at about the top of the circle on their off-hand so they can receive the pass in a good shooting position from the other winger. The center tries to win the face off directly back to one of the wingers. If the puck goes to the player closer to the boards they should pass it right away to the shooter for a one time shot. If the center wins it straight back to the shooter then they go ahead and shoot. The defensive player has to line up on the hash marks to interfere with any of the opponents that are rushing out to the shooters. If the center loses the face off, then the defense has to skate right back to position and the two wingers have to apply pressure. RW and LW start on weak sides. RW starts in LD position. LD is on the hashmarks. Faceoff won to the LW, quick pass to the RW, for a one timer. RW then goes to the net, switching with LD to get back to normal offensive and defensive positions. RW must be prepared to play defense, on a shot block, or blocked pass, from LW. LW should read the play, to make sure the pass to RW is there. Pass should be quick andon the taoe. C needs to stay with opposing C, not allowing a pass break up, then crashing the net, on the shot. This play could also work by using a right handed D, for the shot, and keeping wings in traditional position. The wings should still play on the weak side, so that a left handed winger is making the initial pass.